Can plants typically grown for hedgerows also be a source of income? That's the question guiding a new UC study on the potential for farmers to grow elderberries as a commercial crop. Blue elderberry, a California native plant with clusters of small bluish-black berries and a sweet-tart flavor, have long been eaten by Native Americans in the western states and are used today in jam, syrups, wines and liqueurs. And while elderberry orchards are popping up in parts of the Midwest, California's elderberries are usually just grown on field edges, and elderberry products sold retail rely mostly on foraged crops or imports. Elderberries are a rich source of vitamin C, and also contain vitamin B6 and iron. 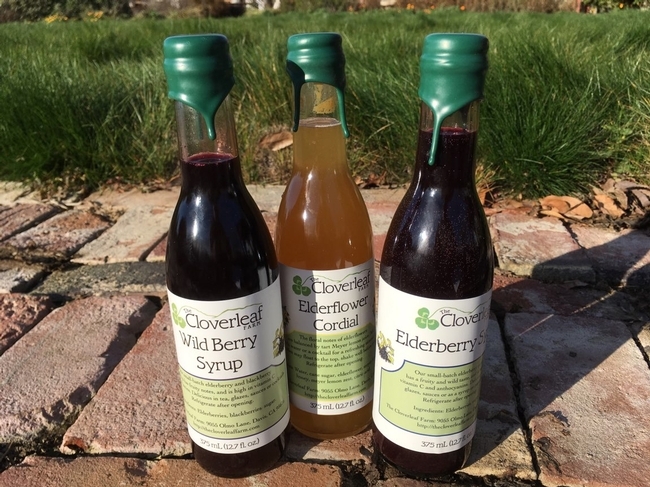 Farmers at The Cloverleaf Farm near Davis are already selling elderberry products from plants grown on their farm, alongside their blackberries and stone fruits. And they find that customers love them. The farmers want to understand the viability of growing elderberries for market beyond their nascent effort, bringing some of the out-of-state production home. The UC Sustainable Agriculture Research and Education Program (SAREP) launched a project in collaboration with the Cloverleaf Farm, the UC Agriculture Issues Center, UC Davis Department of Food Science and Technology, and four Central Valley farmers to assess the farm management practices, nutritional content, and market potential for elderberry and elderberry products in California. Elderberries are typically grown on farms as hedgerows for their ability to attract beneficial insects, act as a windbreak, and sequester carbon, benefiting the overall health of the farm, but not providing direct benefit to a farmer's bottom line. Despite long-running federal cost-share programs for planting hedgerows, the number planted in California is still quite small relative to the large expanses of farmland in the state. 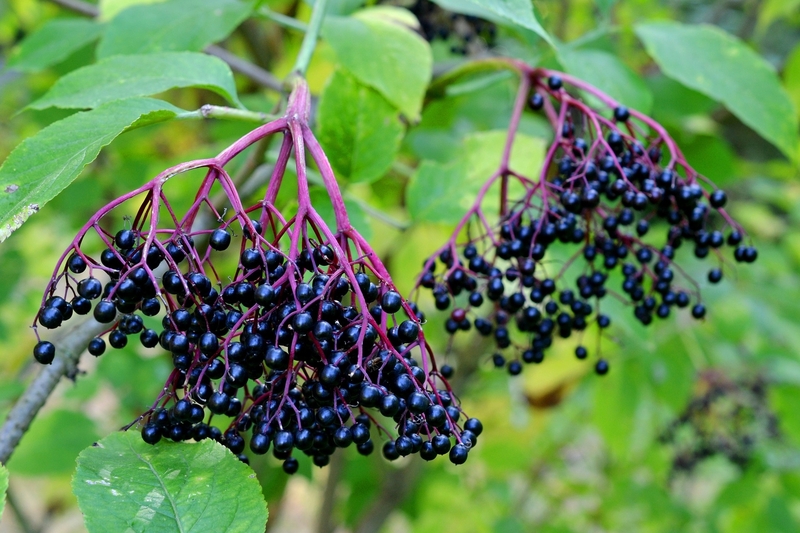 Adding a financial incentive to planting elderberries may help increase the popularity of hedgerows amongst farmers. 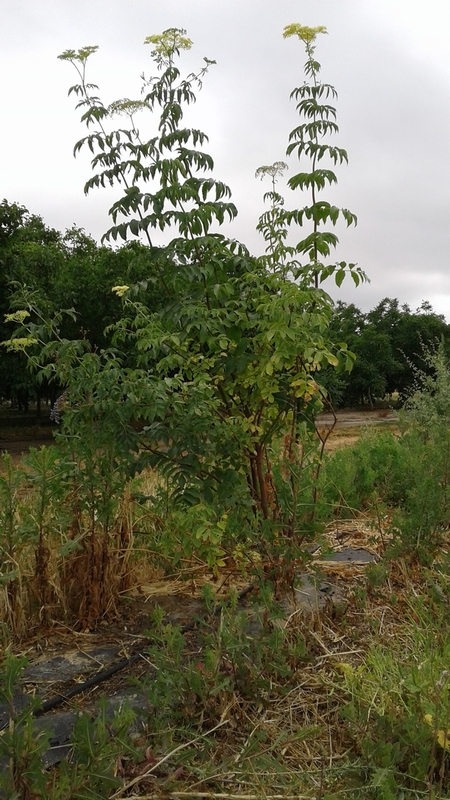 A newly planted Elderberry hedgerow in Yolo County. 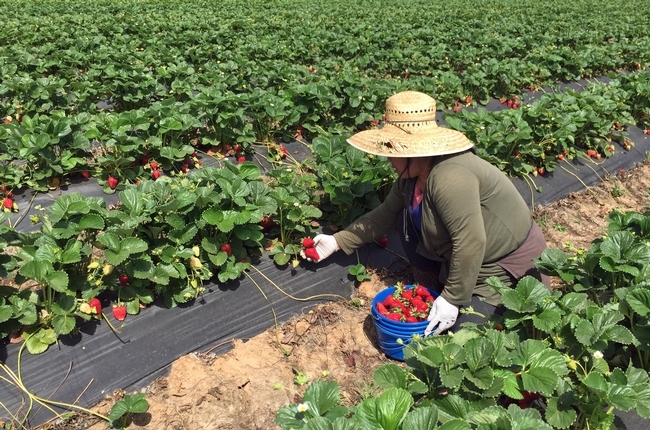 As climate change impacts California with heat and unpredictable water availability, some studies suggest farmers may need to consider diversifying the crops they grow to adapt to changing local climates. Elderberries, which grow in arid California regions along the coast and into the mountains, have the potential to grow in a range of climates and adapt to changing California ecosystems in the future. It is unlikely that farmers would plant entire orchards of elderberries, in part because of restrictions on pruning elderberries that may be home to the Valley elderberry longhorn beetle, a federally threatened species. But for small- and medium-scale growers looking to diversify their income sources, elderberries may provide a boost. The two-year elderberry project now underway will conclude with a growers' production guide, cost of production study, an assessment of market demand and nutritional contents, and workshops to help link growers with buyers interested in elderberry products. The project will also address issues related to the Valley elderberry longhorn beetle and generating income from hedgerows. For farmers interested in learning more about incorporating perennials into annual crop farms and similar agroforestry practices, view a webinar on the topic recently hosted by UC SAREP here. In today's food system, large scale food distribution has become the standard way food moves from farm to market. The system works well to feed a lot of people, and has allowed us to eat tomatoes in December and send produce far distances while keeping it fresh. But the system is not without its sacrifices. Through large scale food distribution, farmers can lose the ability to set their own prices, and small-scale farmers can be cut out from the system for not being able to fill high volume orders. On the consumer side, this system can make local food harder to find and identify. Institutions interested in providing locally grown produce at their cafeterias may need the efficiency buying from large distributors provides, but find they're unable to source food the way they'd like. 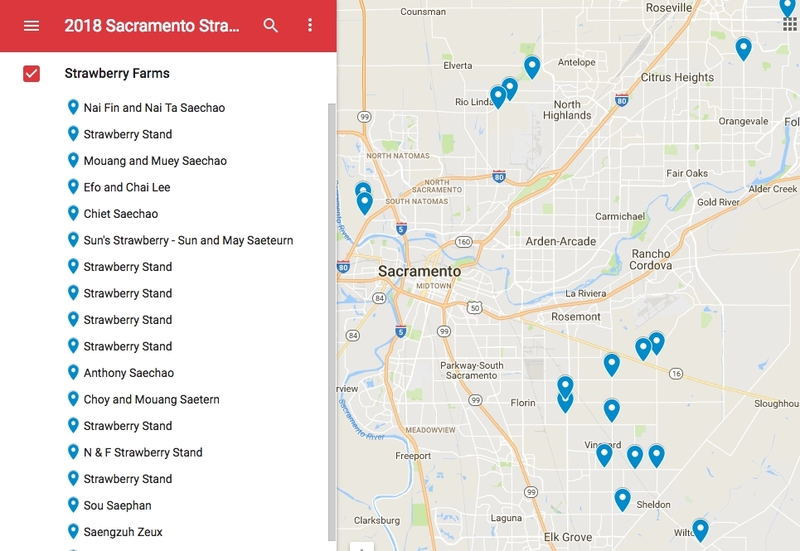 Food hubs are businesses popping up around California and the U.S. trying to create a food distribution system that supports regional food systems. By aggregating food from small and mid-sized farms and selling it to large businesses and institutions, food hubs are able to help realize the consumer's desire for local food while helping small and mid-sized farmers succeed by connecting them with buyers who may otherwise be out of reach. 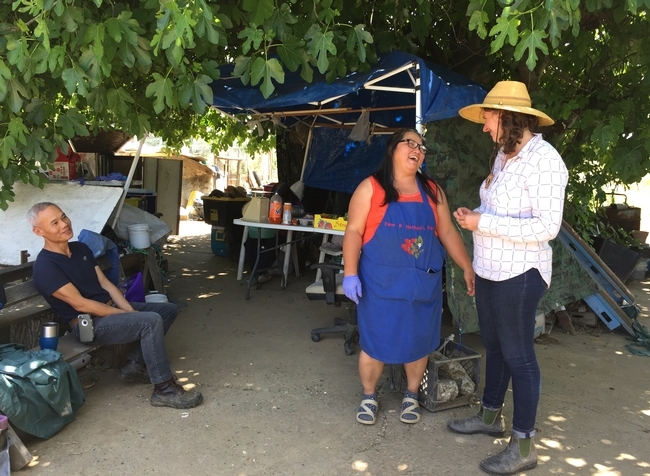 To help ease the challenge of starting these unique businesses, a network of food hubs in California, organized by the UC Sustainable Agriculture Research and Education Program, is learning how to conquer their business start-up and growth challenges together. Watch the eight-minute video below to learn about the role food hubs play in regional food systems and how a network can help them better succeed. 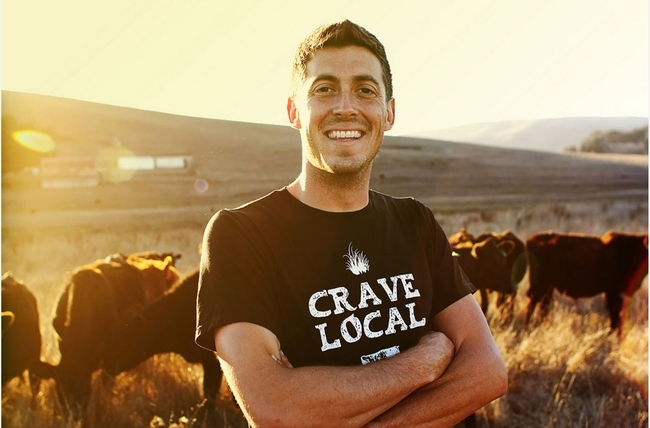 Thomas Nelson, president and co-founder of Capay Valley Farm Shop, a food hub in California's Capay Valley, has built his business around a vision of a thriving regional food system where small farmers succeed. 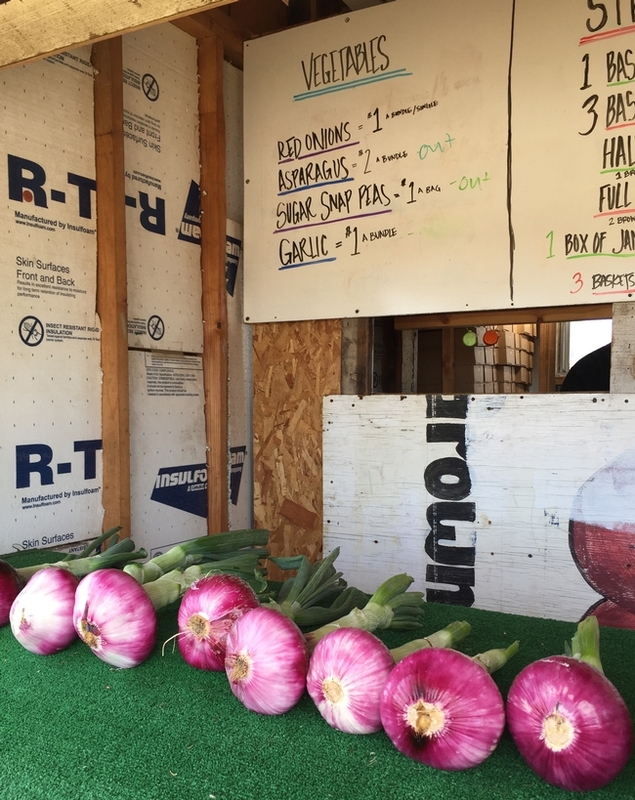 Thomas purchases food from 50 different farms in and near the Capay Valley, and sells primarily to corporate food service in the Bay Area. Thomas works closely with his 50 farmers, helping them plan their crops to best meet the demands of their clients, and working with the beginning farmers to get them through the hurdle of learning how to sell wholesale. Thomas is one member of a new statewide food hubs network created in collaboration with the UC Sustainable Agriculture Research and Education Program (UC SAREP), a statewide program of UC Agriculture and Natural Resources whose work includes improving marketing opportunities for small farmers. The network, funded in part by the UC Global Food Initiative, brings together food hub mangers to learn from one another and collectively pave the way for successful food hubs in California. 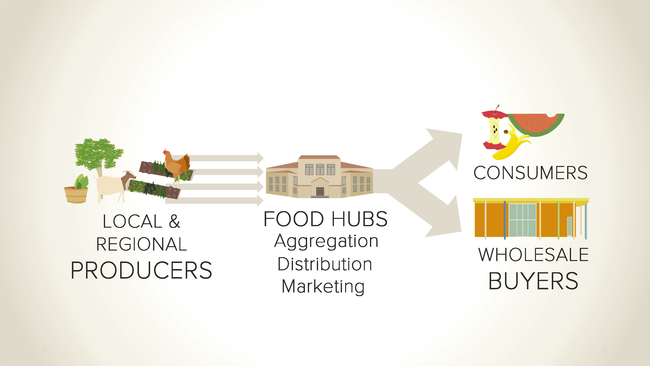 The food hub business model is a relatively young one, few food hubs existed in the United States before 2008. Today, hundreds are in business across the country, and they're all trying to figure out similar things: how to best work with farmers and customers to make the business model effective, how to run a food business in a regulation-laden environment, how to increase efficiency without sacrificing price, quality, and the value of local agriculture. There's a hashtag on Twitter for what they're doing: #collabatition, or, collaborating with your competition. UC SAREP acts as the organizing body for the food hub network — coordinating resources to help the hubs wade through the many rules and regulations of operating a food business, and working through the visions of their own businesses and the network collectively. Boxes of melons loaded into Capay Valley Farm Shop's truck, headed for buyers in the Bay Area. One of those potential larger buyers is an organization close to home — the kitchens of the University of California. “UC SAREP plans to interview kitchen directors from UC campuses all around the state to see what keeps them from buying local food, and whether the food hub business model is one that can support the desire they have to incorporate local food into their kitchens,” Gwenaël said. And past successes show that food hubs can play an important role in linking UC dining programs with local farms. 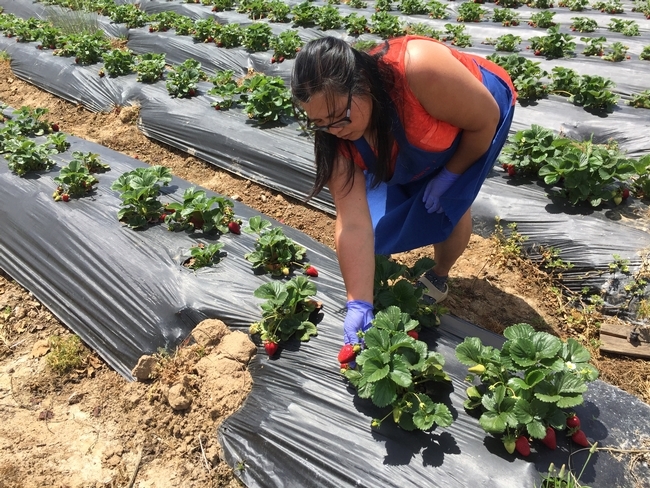 According to a recent report from the UC Global Food Initiative, through a relationship with the food hub Harvest Santa Barbara, UC Santa Barbara is currently able to source 23 percent of its produce from within 150 miles of campus. 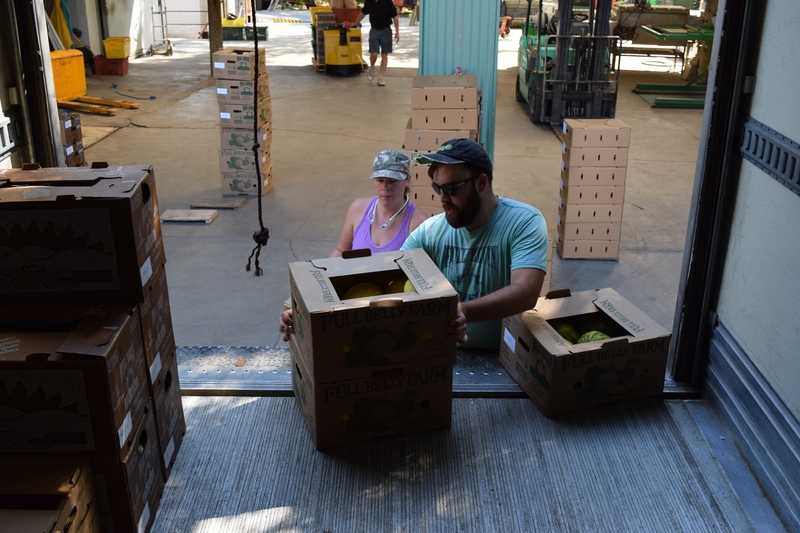 The UC SAREP website offers a number of resources that can assist food hubs as well as farmers looking to see their produce wholesale. Find those resources here. Stay tuned for an upcoming article on food hubs in the next issue of California Agriculture journal. 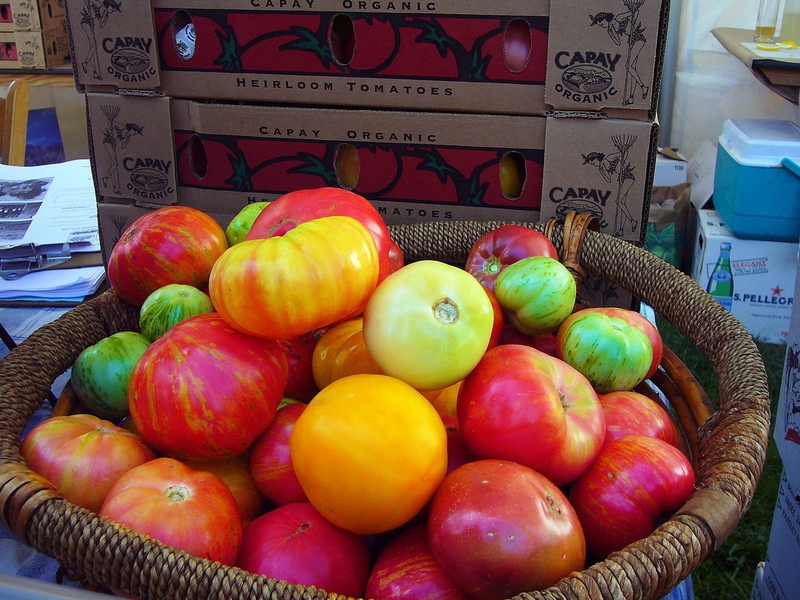 Heirloom tomatoes are a farm-to-fork favorite. In recent years, heirloom tomatoes have become a farm-to-table favorite. Some consumers are willing to pay a hefty price at trendy restaurants, farmers markets, roadside stands, and even local grocery stores for tomatoes with irregular shapes, vivid colors and rich tomato flavor. The consumer demand presents an opportunity for small-scale farmers, and a challenge. 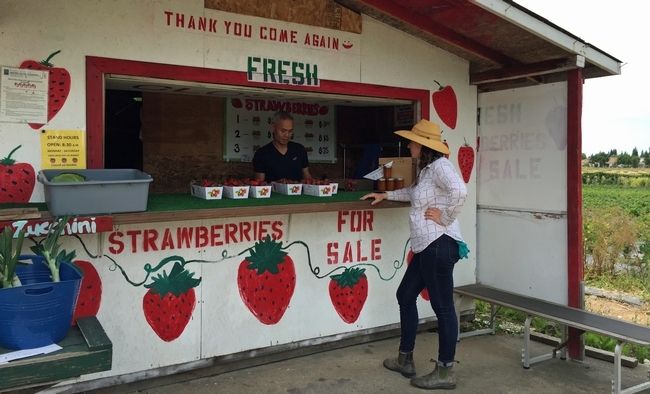 When Lloyd joined UCCE last summer, she began visiting small-scale producers in the counties she serves. 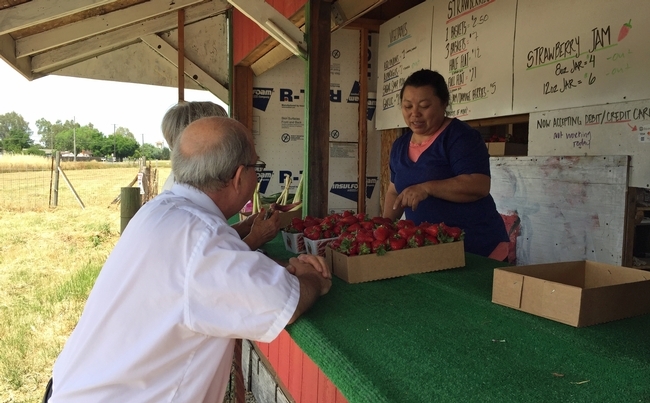 “I realized very quickly how important fresh market tomatoes are to these growers,” Lloyd said. 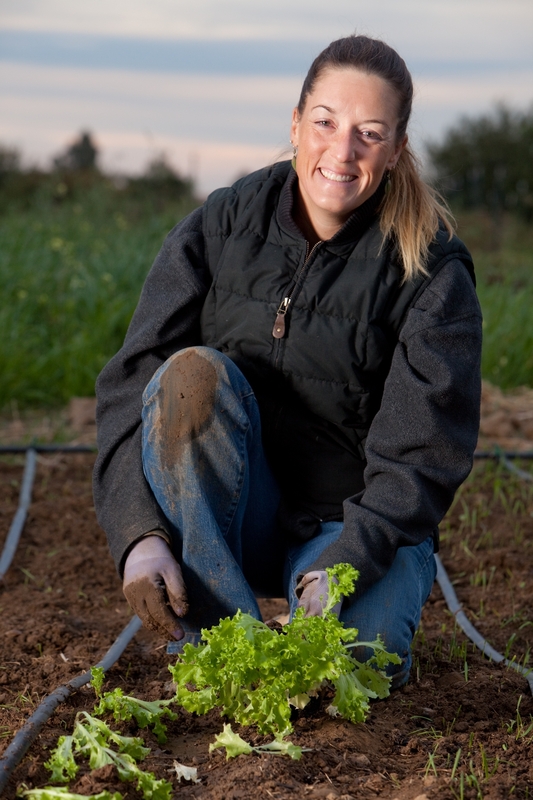 Because she holds a doctorate degree in plant pathology from UC Davis, Lloyd is well-positioned to begin her research program with a small tomato grafting project on UC Davis farmland. Her idea is grafting the particularly delicious heirloom varieties onto tomato roots that are resistant to soil-borne diseases. Lloyd said the process is simple and an individual can easily learn to graft tomatoes. But to do so cost effectively with the quality and success rate necessary for economically viable production, it may make most sense to work with a commercial nursery. Lloyd is conducting a quarter-acre field trial with the three most common heirloom varieties – Brandywine, Cherokee purple and Marvel stripe – plus the yellow-hued Sun Gold cherry tomato and a non-heirloom salad tomato, Charger. Several growers in the area have also planted them in their commercial operations. In addition to collecting data from the trial that will help small farmers decide whether grafted tomatoes make sense for their operations, Lloyd and her research associates will harvest many bushels of fresh tomatoes from the plots. 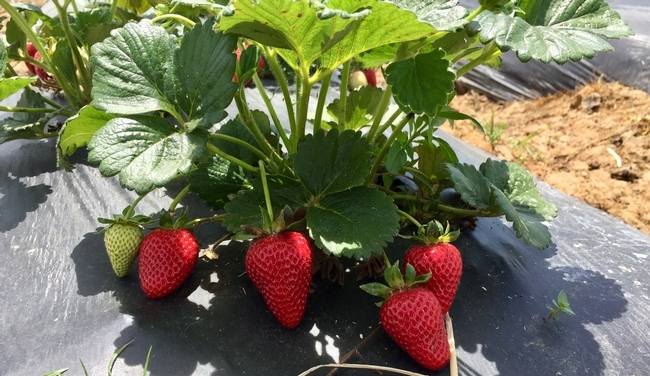 Some will be sold at the UC Davis farm store to help support the research, and as for the rest, “We're definitely going to eat them,” Lloyd said. “I enjoy them raw with olive oil, salt, vinegar and a little basil,” she said. Running a small-scale farm or ranch isn't easy; it requires hard-learned skills, innovative marketing and a supportive community. 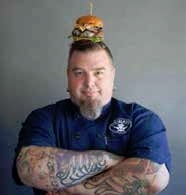 Farmers and ranchers from all over California will join with farmers' market managers, educators, small farm advocates, and some of the most creative of Sacramento's Farm to Fork chefs at the California Small Farm Conference, held this year at the DoubleTree Hotel in Sacramento from March 5 to March 8, 2016. For three days, about 400 attendees will join workshops, explore with field courses, network with colleagues and enjoy a few social events. The now-annual conference was started by the UC Agriculture and Natural Resources (UC ANR) Small Farm Program in 1982 as a unique opportunity for small-scale farmers to learn, network and grow their businesses. UC ANR specialists, advisors and staff continue to contribute to the conference as members of the board of directors and as educators presenting science-based information at workshops and field courses. The conference offers workshops in five different themes. This year, among many other speakers, UC Cooperative Extenison (UCCE) small farms and agricultural economics advisor Ramiro Lobo will lead a workshop on risk management strategies for farm enterprise diversification; Alda Pires, UCCE Cooperative Extension specialist in urban agriculture and food safety, will speak at a workshop on food safety on bio-diversified small-size farms and the FSMA Produce Safety Rule; and UCCE advisor Paul Vossen will teach about both growing cider apples in California and irrigation management for olive growers in a time of drought. In addition to UC and other educators, each of the 25 workshop sessions includes the perspective and practical experience of at least one small-scale farmer or farmers market manager. Sunday, March 6, features all-day field courses and short courses, giving participants a chance for deeper understanding and multiple perspectives as they explore their choice of four different topics. Two of the courses this year will be led by UC ANR educators or staff. For the on-site short course, "Starting a SUCCESSFUL Specialty Food Business," Shermain Hardesty, a UCCE specialist in the Department of Agricultural and Resource Economics at UC Davis (and leader of the UC Small Farm Program) teams up with Linda Harris, a UCCE specialist in Food Safety and Microbiology at UC Davis, Dan Sullivan, a specialty food business expert and specialty food producers, Jason Poole of Preservation & Co. and Courtney Smith of Bloomingcamp Ranch. UCCE Agritourism Coordinator Penny Leff will lead a field course named, "Direct Marketing: Farmers' Markets, Farm Stands, U-Pick and Wine Tasting," that will visit and learn from some of Sacramento region's expert practitioners of these various direct marketing venues. Small Farm Conference and showcases the beautiful bounty of the region. Attendees will taste the creations of Sacramento's best Farm-to-Fork chefs, brewers, winemakers and artisan food and beverage producers. Local farmers, including Riverdog Farm, Full Belly Farm, Heavy Dirt Farm, Dragon Mushrooms, and others are providing meat and produce for the chef's cook-off contest (you vote for your favorite) featuring chefs from Mulvaney's, Magpie Cafe, Localis, Federalist Public House, the Culinerdy Cruizer, and Sacramento's Food Literacy Project. Proceeds ($50 ticket - purchase here or at the door) support the Small Farm Conference scholarship program. Online registration for the conference has now closed, but on-site registration is welcome! For more information, see the California Small Farm Conference website, or phone (888) 712-4188. See you there! Photo of Guido Frosini, True Grass Farms, by Janae Lloyd, a winner of the farm conference 2015 photo contest.